Revolver® soft bait provides the most palatable formulation of the most widely used active ingredient, Bromadiolone. It is the single-feed solution when rotating to a Bromadiolone rodenticide in your biosecurity rodent control program. Revolver contains no-wax promoting quick feeding & results, in a low-cost per placement 12 gram (0.42 oz.) pouch. Advanced Technology: food-grade oils & grains produce an aroma attracting rodents away from competing food sources, providing strong knock-down control of the toughest rodent populations. When compared to competitive green wax-blocks, Revolver no-wax soft bait outperforms with unmatched palatability, no bait melt in high temperatures or decreased control in cold environments, making it the most desirable Bromadiolone rodenticide available. 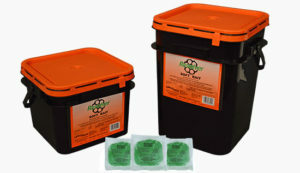 Effective and Economical: no-wax soft bait pouches are easy to use and allow tailored dosing to control heavy rodent infestations or as a low cost per placement monitoring bait, saving producers money and bait waste. Revolver pouches can also be used like a conventional mini-block anchored in a bait station or end-users can strategically place its unique presentation in tight, hard to reach places where mini-blocks will not fit, targeting where rodents live and reproduce. The Choice is Clear: palatability for fast bait acceptance, fast control, low-cost placements, less bait waste & easy clean-up. When choosing a Bromadiolone active ingredient, why not rotate to Revolver? Contact your Liphatech District Sales Representative today for samples or more information! Available in 8 lb. and 16 lb.